Visual Studio Code>Other>vscode-spotifyNew to Visual Studio Code? Get it now. Use Spotify inside vscode. Provides integration with Spotify Desktop client. On macOS this extension uses https://github.com/andrehaveman/spotify-node-applescript (basically a wrapper for https://developer.spotify.com/applescript-api/) to communicate with Spotify. On Windows it uses Spotify Web Api. On Linux it uses a combination of dbus and pactl. it doesn't work without internet connection (Linux and OsX implementations do). full functionality is only available to Spotify Premium users. api calls are rate limited. At the same time it provides tighter integration and it's more or less future proofed. Shows the currently playing song in status bar of vscode. 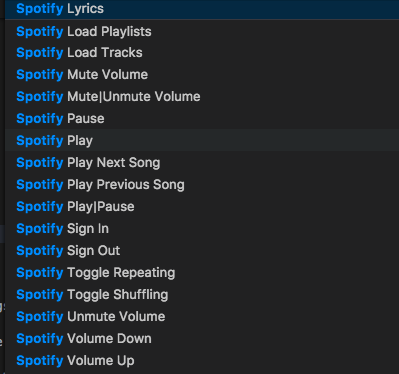 Provides commands for controlling Spotify from vscode. Provides buttons for controlling Spotify from vscode. This project follows the all-contributors specification. Contributions of any kind are welcome, any contributions you make you will be recognised for in the README. To configure keyboard shortcuts the way you want, go to the menu under File , Preferences , Keyboard Shortcuts. This will open the Default Keyboard Shortcuts on the left and your User/keybindings.json file where you can overwrite the default bindings on the right. "description": "Whether to show next button." "description": "Whether to show previous button." "description": "Whether to show play button." "description": "Whether to show pause button." "description": "Whether to show play|pause button." "description": "Whether to show mute button." "description": "Whether to show unmute button." "description": "Whether to show mute|unmute button." "description": "Whether to show volume up button." "description": "Whether to show volume down button." "description": "Whether to show toggle repeating button." "description": "Whether to show toggle shuffling button." For the full configuration options go here. Note that due to limitations of Spotify's applesctipt API toggleRepeatingButton toggles only 'repeat all' property of spotify. There is no way to set 'repeat one' via vscode-spotify. "description": "Base value of priority for all vscode-spotify elements in Status Bar(priority = basePriority+priority). This is done to avoid 'conflicts' with other extensions. " "description": "Priority of next button." "description": "Priority of previous button." "description": "Priority of play button." "description": "Priority of pause button." "description": "Priority of play|pause button." "description": "Priority of mute button." "description": "Priority of unmute button." "description": "Priority of mute|unmute button." "description": "Priority of volume up button." "description": "Priority of volume down button." "description": "Priority of volume track info." "description": "Priority of toggle repeating button." "description": "Priority of toggle shuffling button."